I tend to avoid trends. While I enjoy fashion, It just doesn't feel right to select what I wear based on what is in style. The fun in fashion for me is finding pieces that feel amazing on, and that I feel flatter my body. I appreciate when I see other people do the same -- especially women who don't have a "fashion magazine" body-type. I see great outfits everywhere, and most of them are made of classic pieces that fit just right, plus accessories where form and function meet. You can find lots of lists online of claiming to be the final word on classic pieces that are always in style. However, I don't always find many of those lists realistic for my work-from-home mom lifestyle. I'm a parent, and I'm fairly active, and a traveler, so things need to pack well, be up for an occasional workout, and be good for chasing a three-year old. I feel like most classic wardrobe lists are made for... maybe someone who spends a lot of time at cocktail parties. And that's just not me. For example, most of these lists include a little black dress. But that's a waste of capsule wardrobe space. If you have a black skirt and a black top you can create the look of the LBD, while having the flexibility to have other looks to from the same pieces. Another example of the failure of a "classics" list is they often include a trench coat, which really isn't that practical. It's not a rain coat, so it won't keep you dry in a downpour. And it's not a thick winter coat, so it won't keep you that warm. They look best styled with dresses and handbags, not the jeans and diaper bags or backpacks needed for parenting. So what are these classic yet stylish mom pieces? 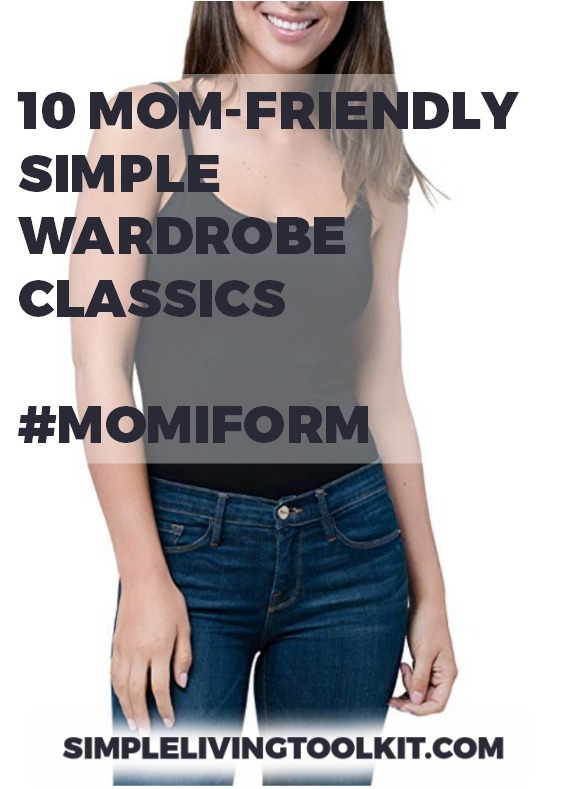 Here are the ten real mom life-friendly pieces I've never seen go out of style. Multiple pairs. No frills, no holes, no weird trendy shapes, colors, or embellishments. Color: black or blue (or both). A v-neck is classic and flattering on most body shapes. My all time favorite is the v-neck tee from Encircled. You could call these yoga pants or leggings. Whatever you call them, these are a casual desk—to-yoga-to-playground staple. Sometimes the chambray shirt is more in style or less so, but I’ve never seen it completely out as a great momiform layering piece. Whether it’s a maxi dress or skirt, this piece is something I usually get a lot of wear out of. My recent version is a black and white floral maxi I picked up at a vintage shop. Here’s a screenshot from a google image search for “black and white maxi” which is a good thing to do to get an idea of what you want before you start shopping. I wear these organic ones from ethical brand Pact. Olive is a darker, greener version of khaki that I find is more flattering on most people. Khaki shorts are often quite light/bright in color, which not only draws the eye, but tends to show dirt and stains. 8. Black running shoes or sneakers. As tempting as it is to buy sneakers in any other color, eventually I regret it if I don’t go with basic, classic black. 9. Black zip tote or market bag. I think all black sunglasses are the only classics except maybe aviators. But with aviators the nose piece part always gets stuck in my hair when I put them up on my head, so I opt for black sunglasses. Hopefully, this list helps you simplify your closet so you can get out and enjoy your life! Finally, if you haven’t signed up yet for the free 3-Day Decluttering Challenge, you have a chance to do so below. You’ll get a three-day burst of inspiration and instruction, plus The Simple Sunday, my weekly note on how to edit your life for more joy.